R Ashwath Narayanan, Carnatic Vocalist, Tamil Nadu, India - Sabhash! R Ashwath Narayanan was born on July 4, 1991 to Sri N Rajagopal and Smt Jayanthi Rajagopal who initiated him to music at the age of 4. Ashwath hails from a family of musically oriented people who have a vast knowledge about carnatic music and he grew up in an atmosphere of musical critics who guided him to improve upon his music constantly. Ashwath’s first Guru was Smt Jayalakshmi Sundararajan, from whom he had training for 2 years on the basics. Soon after that in 1998, Ashwath started learning directly from his guru Sangeetha Kalanidhi Palghat Sri K V Narayanaswamy, who is one of the greatest maestros of all times in carnatic music. His guru saw the raw talent hiding in him and polished it to bring out the true colurs of it. He had 3 years of rigorous training under Sri K V Narayanaswamy till his demise in April 2002. Since then, Ashwath has been learning under his aunt and guru Smt. Padma Narayanaswamy (W/O Sri K V Narayanaswamy) for the past 10 years. Intensive training under his current guru has made him what he is today. He bears on him the lineage of Sri Ariyakkudi Ramanuja Iyengar, whose style of music is considered one of the best Bani’s in classical music. The paddhathi for a successful concert which he set forth is one of the most followed style by today’s musicians. He is currently pursuing his 4th yr in B.tech (Industrial Biotechnology) in SASTRA University, Thanjavur. * Has been giving several concerts in all leading organizations like Narada Gana Sabha, Sri Krishna gana sabha, Bharat Kalachar, Naada inbam, Tirumala Tirupathi Devasthanam (TTD), Brahma Gana Sabha, Vani Mahal, Gana Mukundapriya, Tyagaraja vidwath samajam, etc. both during their monthly series and during the December season. * Has been an actively involved person in both School level and College level Culturals and has won several prizes. Has been the Head of the Music team in School and college. * Has performed twice in the “Baala Bruhmum” (both in 2004 and 2005), the very first year it was started and organized by Sri. Abaswaram Ramjhi as a pert of issai mazhalai group, which was telecast in JAYA TV. 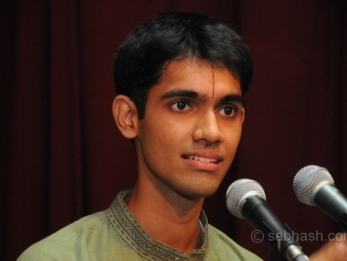 * Has been performing at Thiruvaiyaru Thyagaraja Aradhana from the age of 7. * Has given 2 Hours concerts in Deepam TV which is a European tamil channel in the years 2005 and 2007. * Gave the inaugural concert at the “Spirit Of Youth” series conducted by The Music Academy,Chennai in the year 2008. * Has participated and given a concert at the “Ganesh Chathurthi Festival” at Malaai Mandir, New delhi in 2009. * Has performed this year at the Maharaja’s palace in Trivandrum in September 2011. * Has given concerts at Bangalore and in Chennai at various sabhas like Naradha Gana sabha, Nadha inbam, Bramha gana sabha, Karthik fine arts, Sastri hall and at Anna Nagar Sasta Temple during the December season 2011. Narada Gana Sabha, Indian Fine Arts, Mylapore Fine Arts ,etc. Has won the Tambura Prize in the senior level “Ragam Neraval Swaram” singing competition conducted by the Mylapore Fine Arts Club, Chennai. Has been given a “Special prize” in the CARNATIC IDOL contest conducted by CARNATICA in the year 2008, and was judged by eminent vidwans like Sri. T.N.Krishnan , Dr.N.Ramani, Sri Neyveli Santhanagopalan, Smt. S Sowmya, Smt. Suguna Purushottaman, etc. Has won the GOLDEN VOICE OF THE YEAR 2012 in the reality show Tanishq Swarna Sangeetham conducted by Raj TV and was appreciated by a lot of artistes who came as chief guests including the Bombay sisters, Smt. Sudha Ragunathan, Smt. Nithyashree Mahadevan, Sri. O. S. Arun, Mrs. Lalgudi vijayalakshmi. Sabhash.com is the one-stop destination for the latest news and information on the performing arts of India - classical music and dance, theatre, bhajans, discourses, folk performances, and other lesser known art forms. Institutions that revolve around the performing arts have exploded in numbers, and thanks to the Internet which has made information easily accessible, the number of rasikas has grown too. Corporate patronage has played a big part in increasing the world-wide reach of the Indian arts. Sabhash wishes to be a platform for inclusive growth giving an equal opportunity and recognition to not only the main performer but also the artistes who accompany them on stage, and the people who work backstage and play the role of unsung heroes.